Whether you are a new or seasoned runner, it is important to know how many miles you put on your shoes. Running or walking too many miles on the same pair of shoes can lead to injury, but it can be challenging to know when your shoes have begun to break down. 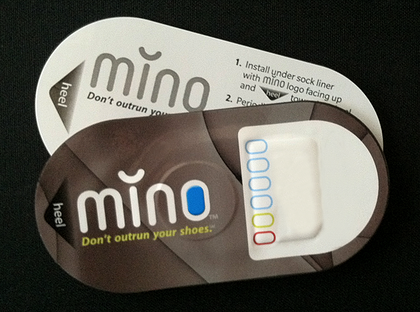 The MINO (pronounced minnow) is a simple, inexpensive, and easy to use sensor device which is placed under the sock liner or Superfeet insole in your NEW shoes. It automatically tracks the age of your shoes while you are running, alerting you when you hit 400 miles. This device is also useful for people who use multiple pairs of running shoes by simplifying the task of tracking mileage on each pair. Place the MINO in the heel of your shoe under your Superfeet insole or sock liner. The device is not noticeable in the shoe once you begin moving in it. You can check your mileage at any time by pulling the sock liner up and pushing the button; the lights will indicate whether you are getting close and need to replace your shoes. Stop by to ask a FIT Specialist to show you how easy the MINO is to use.